I'm trying to run an ESRI ArcGIS extension but am getting an error that the extension is not installed or the license is not available. What do I do? 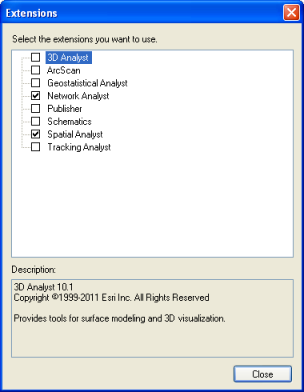 This typically occurs if the extension has not be enabled within the ESRI software. 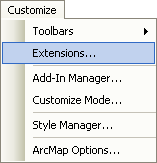 To enable an extension, select Extensions from the Customize menu in ArcMap, ArcCatalog, ArcGlobe, or ArcScene (the application that comes with the ArcGIS 3D Analyst extension). To enable an extension, check the box next to it. If the extension is successfully enabled, the box will appear checked.